Saint Lucie County Public Schools are fortunate to have a host of extraordinary employees who come to work each day with a passion and commitment to the students they serve and the community they call home. Because of the sheer numbers of qualified candidates, selecting a nominee can be difficult. Thus it is with pride that Superintendent Genelle Yost and members of the Saint Lucie County School Board announce the 2014-2015 School Related Employee of the Year finalists. Viola Bryant is Southern Oaks Middle School nominee. Ms. Bryant has worked with the school district for over 33 years and has worn many hats in her career. Not only does Viola perform her duties with dedication and efficiency but is never daunted by any task. She takes every opportunity to further her education and is especially trained in child care development. Viola works in the community to help homeless families find safe shelter and food to eat. She makes home visits to parents and guardians providing information and encouragement so their children can reap the benefit of parents who have been given the tools needed to assist their own children in achieving academic success. Simone Catrambone is the nominee from Lakewood Park Elementary. She is a native of Brazil and made a life-changing decision to leave her small city near Rio De Janiero to immigrate to the United States. She began her career in Saint Lucie County about ten years ago as an ESOL Paraprofessional. She continued her efforts to become a fluent English reader and speaker. Children who were also striving to speak, understand, and read English looked to her for help to achieve that same goal. Teachers, too, took advantage of her bilingual abilities to enhance their instruction for students whose first language was not English. Ms. Catrambone produced several school plays exclusively for ESOL students – “Readers’ Theater.” Simone constructed the sets, made all the costumes, and directed the highly successful plays. Recently she teamed with the Boys and Girls Club to present an evening play for parents and family members. Alexandra Sanders represents Treasure Coast High School as their nominee and district finalist for 2014-2015. Ms. Sanders has worn many hats in her career in Saint Lucie County. She has been a substitute teacher, a clerk, and is currently the Registrar. In that role, Alexandra welcomes new families to Treasure Coast High School every week. Many families have been impressed with her warm welcome and willingness to discuss everything from class schedules to finding a local dry cleaner. Newcomers to the community often sing her praises to administration. Alexandra also mentors students reinforcing the strong academic accomplishments and opportunities they can find at Treasure Coast High School. In addition, Ms. Sanders works and meets with a group of young girls monthly a Ft. Pierce Westwood High School. These girls are finding their way through very difficult life circumstances and have found a friend and guide in Alexandra. Alexandra also serves on a number of committees at Calvary Chapel. She spends countless hours giving back to members of her church family and for young ladies who need their voices to be heard. 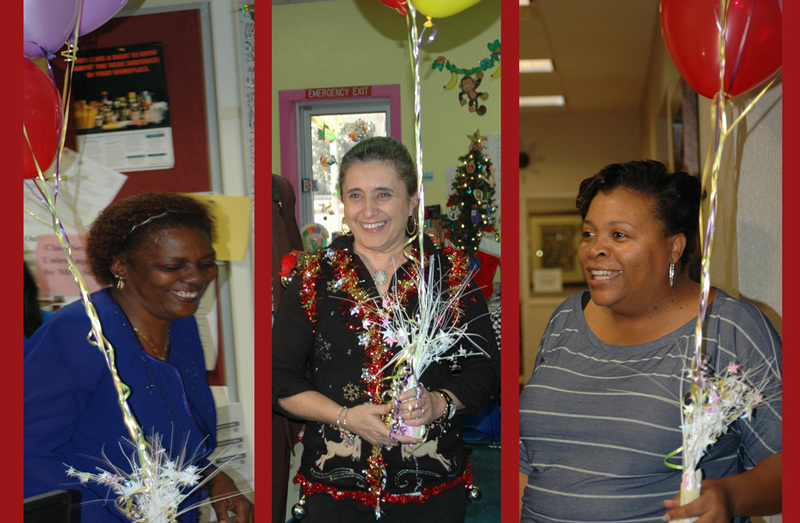 Congratulations to all our School Related Employee of the Year finalists! We are so very proud of you! !